A time of sorrow requires a supportive expression of comfort. 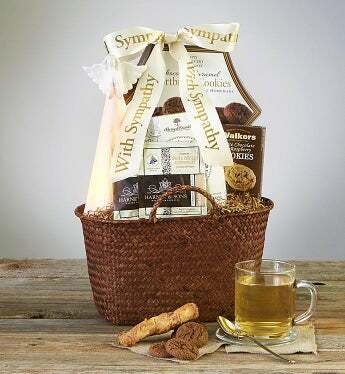 The Moments of Reflection Sympathy Basket is filled with Walker's® White Chocolate Raspberry Cookies, Harry & David® Almond French Twists, Harney & Sons® White Vanilla Grapefruit Tea, and a Ceramic Angel with an electric light. Send a supportive expression of comfort with this woven sympathy gift basket filled with an assortment of cookies from Walker's® and Harry & David®, Harney & Sons® tea, and a ceramic Angel with electric light.